Elayna Fernandez, of Fort Worth, Texas, also known as “The Positive MOM,” was named one of the Top Latina Influencers in the U.S. and awarded as the Best Latina Lifestyle Blogger of 2016 by LATISM (Latinos in Tech Innovation and Social Media) for her remarkable labor of love, empowering moms to live a life with purpose on purpose. Fort Worth, TX, November 27, 2016 --(PR.com)-- Elayna Fernandez, of Fort Worth, Texas, also known as "The Positive MOM," was awarded as Best Latina Lifestyle Blogger of 2016 for her highly acclaimed blog, ThePositiveMOM.com, and named a "Top Latina Digital Influencer" by LATISM (Latinos in Tech Innovation and Social Media), the most powerful and influential network of Latinos and Latinas involved in social media, for the second year in a row. The LATISM Awards were created in 2009 by LATISM founder, Ana Roca, and are presented annually to individuals and organizations that demonstrate commitment to advancing Latino issues, and are using their voice, platforms, and efforts to advocate for causes that impact the Latino community. 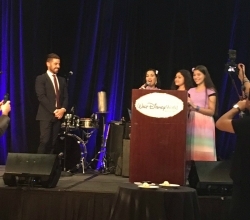 The 8th annual LATISM conference took place at Disney's Coronado Springs Resort in Orlando, Florida, with the theme of "Latinos As Change Agents." "With every blog post I publish, every book I write, every workshop I teach, every interview or feature in the media, I pray I can be an instrument for moms worldwide to change their 'once upon a time' into their 'happily ever after'... I humbly accept the title of change agent and I commit before you to take consistent actions toward positive change, regardless of whether my position is embraced and celebrated or unpopular and disputed," said Fernandez about the honor of being selected for the Top Influencer Retreat. Fernandez' remarkable work continues to inspire moms around the globe to be their best and raise their kids in a more positive environment. A survivor of poverty, tragedy, and abuse, and a former single mom, she is committed to providing moms with the tools, training, and support to make them happen. Discussions during the conference centered around Education, Health, Civic Engagement, Policy, Technology, Business, as well as Diversity and Inclusion. In addition, LATISM hosts an annual S.T.E.A.M. Fair for kids grades 5th to 12th. “I share this award with my daughters, the inspiration behind all I do,” said Fernandez when receiving the award at the gala, sponsored by Toyota, and hosted by Borja Voces, Social Media Anchor and Reporter at Univision's Primer Impacto. Fernandez was joined onstage by two of her three daughters: Elisha, 14, and Elyssa, 13, who were panelists at the LATISM conference. The young presenters also won 3rd. Place at the 36-hour Hackathon that took place at #LATISM16. Elayna Fernández, known worldwide as The Positive MOM, is an award-winning storyteller, renowned digital strategist, and an avid student of pain. Elayna helps moms rewrite their story, heal their wounds, and create joy, balance, and success on their own terms – in all areas of life. Elayna encourages, empowers, and equips moms to increase their impact, income, and influence, without guilt, shame, or regrets. Latinos in Tech Innovation and Social Media (LATISM), is a nonprofit, nonpartisan organization dedicated to advancing the social, civic and economic status of the Latino community through technology innovation and social media, considered the most powerful and influential network of Latinos/as involved in social media and technology. LATISM’s mission is to empower the Latino community in the areas of Education, Health, Technology and Business through the use of tech innovation and social media.